Seymour Johnson Air Force Base is annexed to Goldsboro, North Carolina, a city on Highway 70 about midway between Raleigh, North Carolina - the state capital - and New Bern, North Carolina - the former capital city - on the coast. Seymour Johnson Air Force Base occupies over 3,300 acres in the southeast section of Goldsboro. 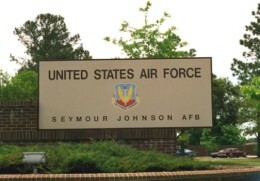 Seymour Johnson Field was opened in April 1942 as Headquarters, Technical School, Army Air Forces Technical Training Command. In June 1943, a secondary mission was added which included preparation of officers and men for overseas duty. 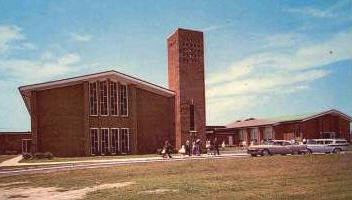 The unit was known as the Provisional Overseas Replacement Training Center. Seymour Johnson Field received a third mission in September 1943: to provide basic military training for cadets preparing to become technical officers in the Army Air Corps. The 75th Training Wing was established to conduct the program through its Aviation Cadet Pre-Training la k- School. The 326th Fighter Group arrived in October 1943 and in January 1944 began training replacement pilots for P-47 Thunderbolt aircraft. In April of that year, basic training of P-47 pilots became the primary mission of Seymour Johnson Field. At the end of WWII in Europe, Seymour Johnson was designated as a central assembly station for processing and training troops being reassigned in the continental United States and Pacific theater of operations. This function was discontinued in September 1945 and the field became an Army-Air Force Separation Center. Seymour Johnson Field was deactivated in May 1946. Community leaders were successful in their campaign to reopen the base in 1956. 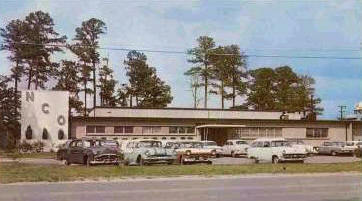 Seymour Johnson Air Force Base was reactivated as a Tactical Air Command base on April 1, 1956. Three months later, the 83rd Fighter-Day Wing was assigned to the base as the primary unit. SAC bases had sinners and saints. Above base chapel and NCO club. In 1958, SAC began dispersing its B-52 bombers. Prior to that each bomb wing had 3 squadrons of 15 aircraft. Each became a strategic wing and was dispersed to another base. The 73rd Bomb Squadron of the 72nd Bomb Wing was used to create the 4241st Strategic Wing. It was assigned to Seymore-Johnson on Oct. 1, 1958. The 4th Fighter Wing, one of the Air Forces most distinguished fighter wings, moved to the base in 1957, replacing the 83rd and has been the host unit since then. The 4th Fighter Wing is the host unit at Seymour Johnson Air Force Base, and accomplishes its training and operational missions with 92 F-15E Strike Eagles. Two of the wings four fighter squadrons are operational units, capable of deploying world-wide on short notice and immediately generating combat power. The other two squadrons are responsible for training all F-15E aircrews for the Air Force.